Sun Cellular offers a new kind of internet browsing rate where you volume is measured instead of time. DATA LITE 50 plan is effective to those who are using push emails and to those who are fond of waiting social notifications and updates. Using this plan you are only charge with the amount of Kb’s you used instead of hours or days rate of your subscription. Like for example you want to synchronize your Exchange email account on your Android phone, with DATA LITE 50 plan you can send and receive emails without worrying time and bandwidth usage. Sync emails is almost good as texts, sending and receiving a new email message takes only few Kb’s of your avail 50MB plan. 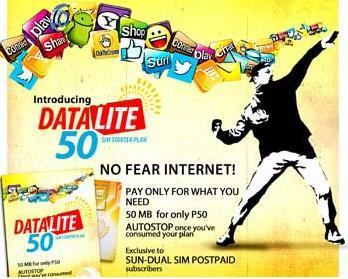 Usage in excess to 50 MB will be charge P1 per MB. This is available on to all Sun Cellular postpaid subscribers. With your 50MB you can view social posts, view web pages, receive plain text emails and you can download and send email attachments. This plan is effective and applicable when using a mobile device.